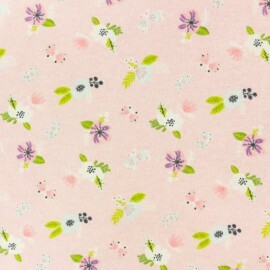 Ideal to make a pretty pajamas for summer time, this Tractor scratched cotton fabric by Poppy design is light and very soft. 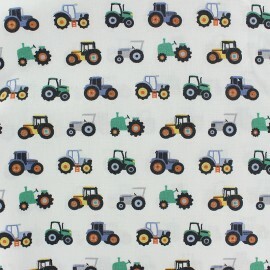 With its tractor patterns on a white background, it will delight your small aspiring farmers ! 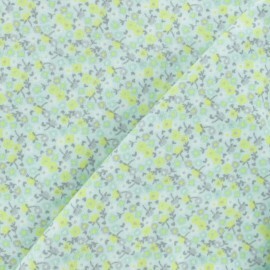 Make pretty pajamas with this light green Petite Fleur flannel fabric, designed by Timeless Treasures. With its pretty tiny yellow and green flower patterns, you will fall in love with this very comfortable and classic fabric, ideal for winter! 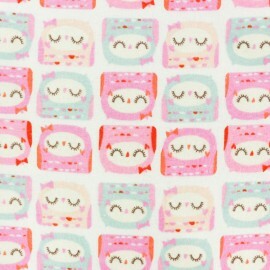 Make a pretty pajamas with this white Panda flannel fabric, designed by Dear Stella. 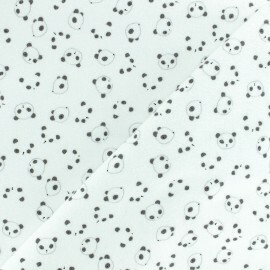 With its pretty panda patterns, you will fall in love with this very comfortable and classic fabric, ideal for winter! 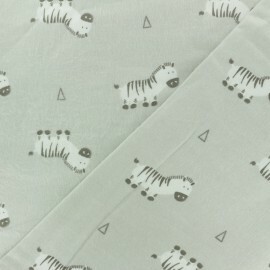 Make pretty pajamas with this mint green Petit Panda flannel fabric, designed by Dear Stella. With its pretty panda face patterns, you will fall in love with this very comfortable and classic fabric, ideal for winter! 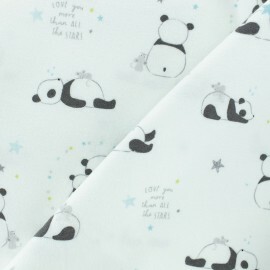 Make a pretty pajamas with this white Petit Panda flannel fabric, designed by Dear Stella. With its pretty panda face patterns, you will fall in love with this very comfortable and classic fabric, ideal for winter! Make a pretty pajamas with this Ice blue Jolies fleurs flannel fabric, from the I Believe in Unicorns collection designed by Camelot Fabrics. With its tiny flower patterns on a light ice blue background, you will fall in love with this very comfortable and classic fabric, ideal for winter! 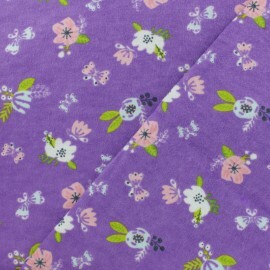 Make a pretty pajamas with this purple Jolies fleurs flannel fabric, from the I Believe in Unicorns collection designed by Camelot Fabrics. With its tiny flower patterns on a purple background, you will fall in love with this very comfortable and classic fabric, ideal for winter! 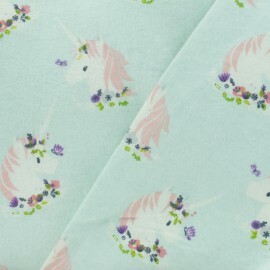 Make a pretty pajamas with this Ice blue Unicorn flannel fabric, from the I Believe in Unicorns collection designed by Camelot Fabrics. With its sweet little unicorns patterns on a light ice blue background, you will fall in love with this very comfortable and classic fabric, ideal for winter! 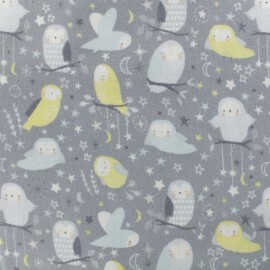 Make a pretty pajamas with this Birdy flannel fabric designed by Camelot Fabrics. With its girly bird patterns on a white background, you will fall in love with this very comfortable and classic fabric, ideal for winter! 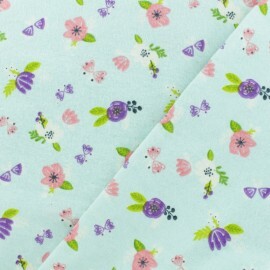 Make a pretty pajamas with this Jolie Chouette flannel fabric designed by Camelot Fabrics. With its tiny girly owl patterns on a white background, you will fall in love with this very comfortable and classic fabric, ideal for winter! Make a pretty pajamas with this pink Jolies fleurs flannel fabric, from the I Believe in Unicorns collection designed by Camelot Fabrics. With its tiny flower patterns on a light pink background, you will fall in love with this very comfortable and classic fabric, ideal for winter! 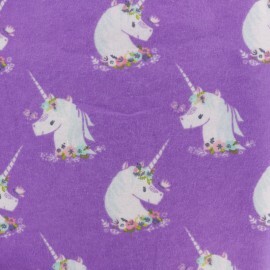 Make a pretty pajamas with this purple Unicorn flannel fabric, from the I Believe in Unicorns collection designed by Camelot Fabrics. With its sweet little white unicorns patterns on a purple background, you will fall in love with this very comfortable and classic fabric, ideal for winter! 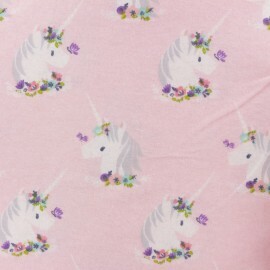 Make a pretty pajamas with this pink Unicorn flannel fabric, from the I Believe in Unicorns collection designed by Camelot Fabrics. With its sweet little unicorns patterns on a light pink background, you will fall in love with this very comfortable and classic fabric, ideal for winter! 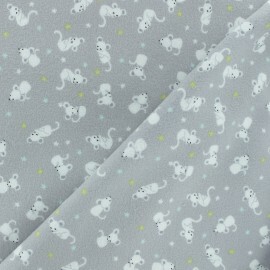 Make beautiful winter home wear for your children with this bamboo flannel fabric. 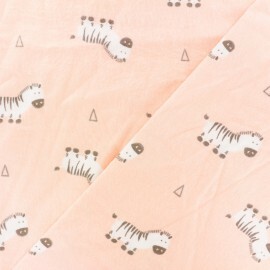 Fall for this Zebra Bamboo flannel fabric from Camelot fabrics designer, with its sweet drawings of small zebras on a blush pink background, a very comfortable classic, ideal for winter! 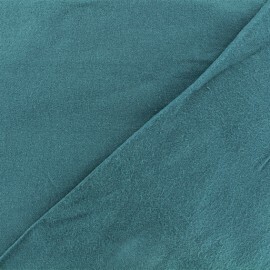 Make beautiful winter home wear for your children with this bamboo flannel fabric. 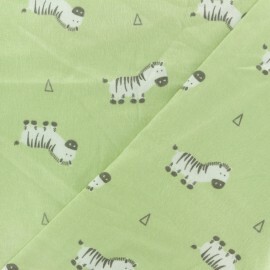 Fall for this Zebra Bamboo flannel fabric from Camelot fabrics designer, with its sweet drawings of small zebras on a green background, a very comfortable classic, ideal for winter! 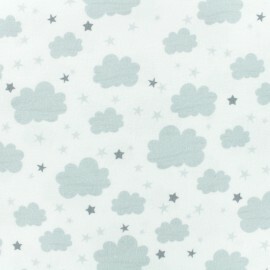 Make beautiful winter home wear for your children with this bamboo flannel fabric. Fall for this Zebra flannel fabric from Camelot fabrics designer, with its sweet drawings of small zebras on a light grey background, a very comfortable classic, ideal for winter! 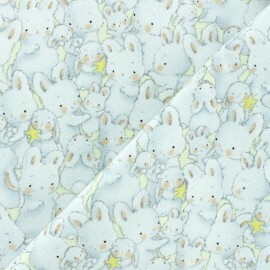 Make beautiful winter home wear for your children with this bamboo flannel fabric. 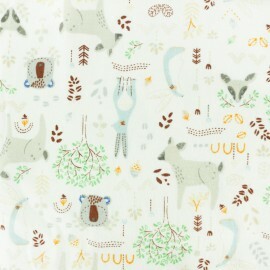 Fall for this Forest friends flannel fabric from Camelot fabrics designer, with its sweet grey drawings of forest animals on a white background, a very comfortable classic, ideal for winter! 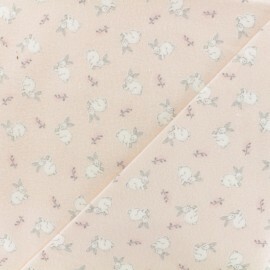 Make beautiful winter home wear for your children with this bamboo flannel fabric. 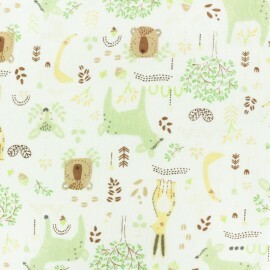 Fall for this Forest friends flannel fabric from Camelot fabrics designer, with its sweet green drawings of forest animals on a white background, a very comfortable classic, ideal for winter! 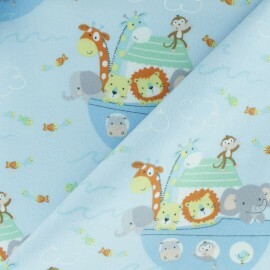 Make beautiful winter home wear for your children with this bamboo flannel fabric. 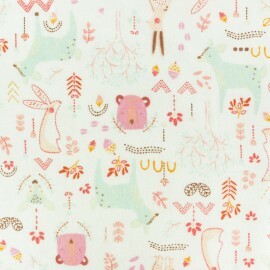 Fall for this Forest friends flannel fabric from Camelot fabrics designer, with its sweet pale pink drawings of forest animals on a pure white background, a very comfortable classic, ideal for winter! 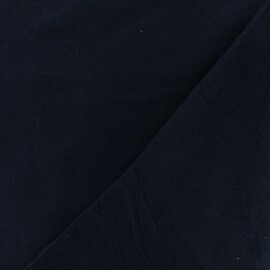 Make pretty pajamas or a pretty skirt with this Navy blue flannel fabric. You will fall in love with this classic and very comfortable fabric that is ideal for winter! 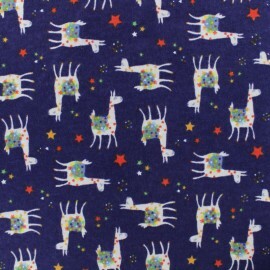 Welcome to Peru with Sacha, the llama, go to explore the Inca treasures and make pretty pajamas with this blue flannel fabric, very comfortable fabric, ideal for comfy winter ! 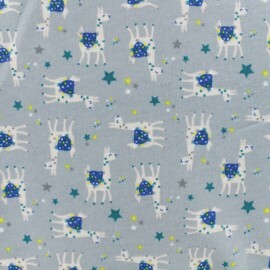 Welcome to Peru with Sacha, the llama, go to explore the Inca treasures and make pretty pajamas with this grey flannel fabric, very comfortable fabric, ideal for comfy winter ! 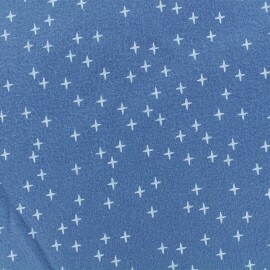 Make pretty pajamas or a nice bed linen set with this niagara blue flannel fabric with white small cross. You will fall in love with this classic and very comfortable fabric that is ideal for winter! 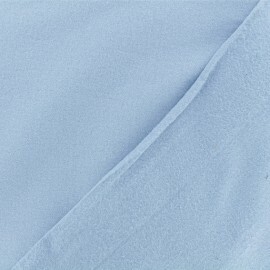 Make pretty pajamas or a nice bed linen set with this blue swell flannel fabric with white small cross. You will fall in love with this classic and very comfortable fabric that is ideal for winter! 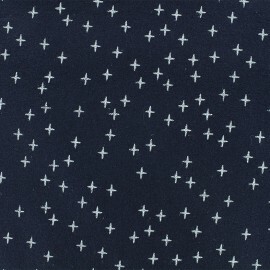 Make pretty pajamas or a nice bed linen set with this dark blue flannel fabric with white small cross. 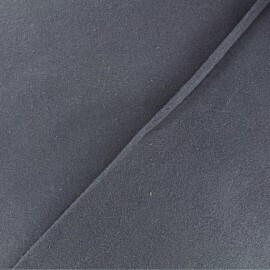 You will fall in love with this classic and very comfortable fabric that is ideal for winter! 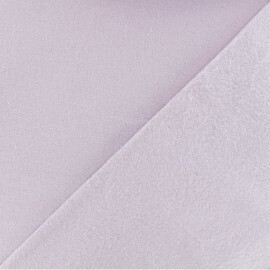 Make pretty pajamas or a nice bed linen set with this water rose flannel fabric with white small cross. You will fall in love with this classic and very comfortable fabric that is ideal for winter! 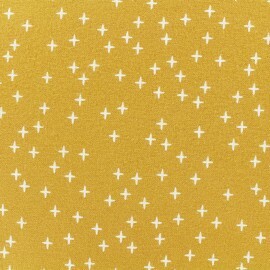 Make pretty pajamas or a nice bed linen set with this mustard yellow flannel fabric with white small cross. You will fall in love with this classic and very comfortable fabric that is ideal for winter! 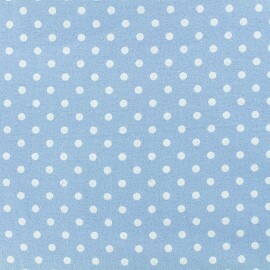 Make pretty pajamas or a nice bed linen set with this niagara blue flannel fabric with small dots. You will fall in love with this classic and very comfortable fabric that is ideal for winter! 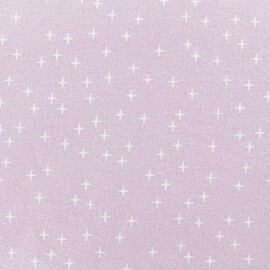 Make pretty pajamas or a nice bed linen set with this water rose flannel fabric with small dots. You will fall in love with this classic and very comfortable fabric that is ideal for winter! 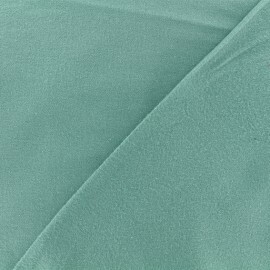 Make pretty pajamas or a pretty skirt with this sauge green flannel fabric. You will fall in love with this classic and very comfortable fabric that is ideal for winter! 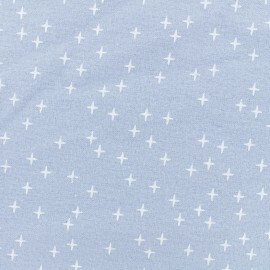 Make pretty pajamas or a pretty skirt with this niagara blue flannel fabric. You will fall in love with this classic and very comfortable fabric that is ideal for winter! 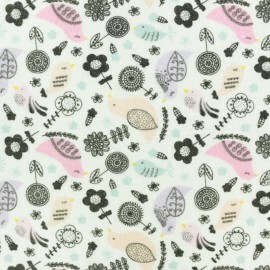 Make pretty pajamas or a pretty skirt with this peacock flannel fabric. You will fall in love with this classic and very comfortable fabric that is ideal for winter! 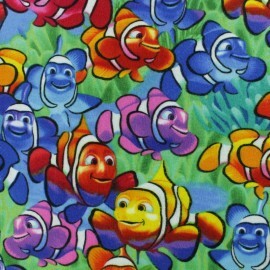 Make pretty pajamas or a pretty skirt with this blue swell flannel fabric. You will fall in love with this classic and very comfortable fabric that is ideal for winter! 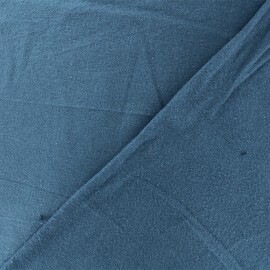 Make pretty pajamas or a pretty skirt with this blue grey flannel fabric. You will fall in love with this classic and very comfortable fabric that is ideal for winter! 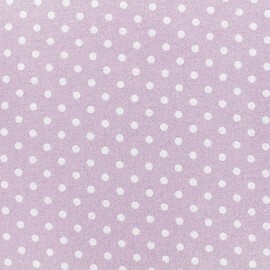 Make pretty pajamas or a pretty skirt with this fig flannel fabric. You will fall in love with this classic and very comfortable fabric that is ideal for winter! 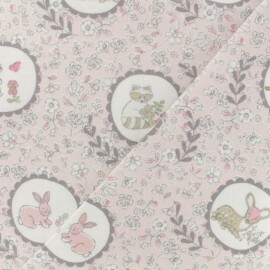 Make pretty pajamas or a pretty skirt with this rosewood flannel fabric. You will fall in love with this classic and very comfortable fabric that is ideal for winter! 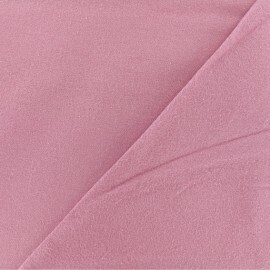 Make pretty pajamas or a pretty skirt with this rose water flannel fabric. You will fall in love with this classic and very comfortable fabric that is ideal for winter! 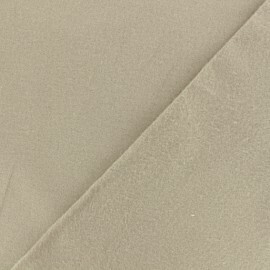 Make pretty pajamas or a pretty skirt with this linen grey flannel fabric. You will fall in love with this classic and very comfortable fabric that is ideal for winter! 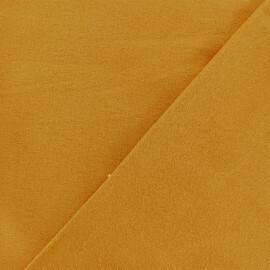 Make pretty pajamas or a pretty skirt with this plain mustard yellow flannel fabric. You will fall in love with this classic and very comfortable fabric that is ideal for winter! 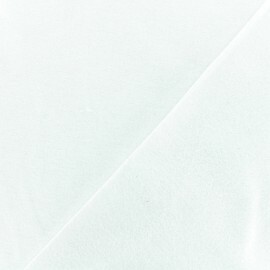 Make pretty pajamas or a pretty skirt with this plain white flannel fabric. 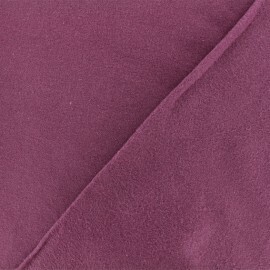 You will fall in love with this classic and very comfortable fabric that is ideal for winter!